About the benefits of milk , we hear from early childhood. It cook porridge for kids, dairy products, or cooked cocoa. And throughout life, most people consume milk and its products daily. It is therefore very important to have a good quality and safe. Because milk is a perishable product, when making a purchase, you first need to pay attention to its shelf life and storage conditions. You can buy only where there is special equipment for cooling, i.e. in shops, pharmacies, supermarkets, etc. But in any case not on the market, where there are no refrigerators. The maximum duration of transport without temperature control for 2 hours (this applies to fresh milk). Also pay attention to the integrity of the packaging. It should not be broken. Of course, to really determine the quality of milk is possible only in laboratory conditions. For this purpose we developed several Standards under which test his physical (density), chemical (fat content, proteins, etc.) and biochemical (acidity, reductasa test) performance. At home you can check in several ways:1. Note the color and consistency. 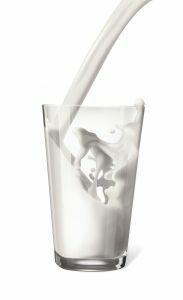 If the milk quality, its color should be pure white with no patches of another color, and the consistency is thick and smooth. Liquid with a bluish tint product means that it was diluted with water. Density can be checked by dropping a drop on the nail. If you spread once - the milk was diluted. 2. Taste. It should be slightly sweet. Too sweet means that the milk is beginning to sour and added sugar to cover the sour taste. In addition, to increase shelf life manufacturers can add soda that is harmful for the stomach. It's also possible to experience.3. Look for foam from milk. This is especially true for milkpurchased home compound. If you poured it in the glass, and the surface formed a light foam, then the milk quality. Otherwise, it can be concluded that it diluted or passed through a centrifuge and removed the cream. Beneficial properties thus greatly reduced.4. If you are really interested in qualitym milk, buy a litmus test. It can help to determine the presence of chemical impurities. Turns blue litmus paper red, and red – slightly blue, if the product is not diluted. If the milk is too alkaline, for example, from impurities soda, the red paper will turn blue.5. Choose healthy milk. Of course, dairy products with a short shelf life. And the shorter it is, the better. If you purchase a product raw, you can see what quantity of cream is formed on its surface. By purchasing from different vendors and comparing the products, you will understand where the fat content higher (and therefore milk is healthier).When purchasing milk , always remember these tips and try to avoid poor quality products!